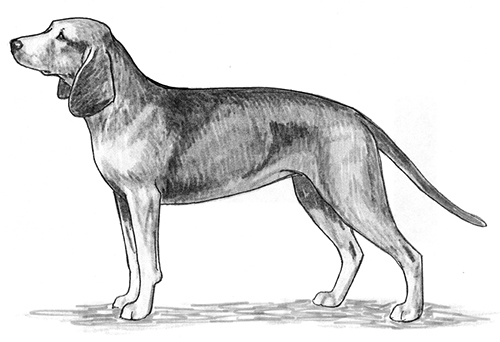 The Bavarian Mountain Hound is descended from the original hunting dogs that were called ‘Bracken’. All Bracken have outstanding abilities for tracking and trailing. The Bavarian Mountain Hound was bred to be a lighter leash trailing scenthound that could be used in mountainous regions. They have been so successful that today they are the classic companion in the mountains of Bavaria for the professional hunter and gamekeeper. The Bavarian Mountain Hound was recognized by the United Kennel Club January 1, 1996. A very well balanced, fairly light, active and mobile, medium sized, short coated dog that is slightly longer than tall, and stands with its rear slightly higher than its shoulders. Calm, self assured and biddable, the Bavarian Mountain Hound is devoted to its owners, but may be reserved with strangers. The skull is relatively broad and very slightly arched. The occiput is not pronounced, and the stop is well defined. The cheeks are only moderately pronounced. The muzzle is slightly shorter than the skull, and sufficiently broad so that it never appears pointed. The nasal bridge is straight or slightly convex. The lips are pendulous. The Bavarian Mountain Hound has a complete set of evenly spaced, white teeth meeting in a scissors or level bite. Disqualifications: Markedly overshot or undershot. Wry mouth. Missing teeth other than P1. Black or dark red, of good size with well opened nostrils. The eyes are not too large or too round. They are brown of varying shades. The expression is clear and alert, and the eyerims are tight fitting. Set on high, broad at the base, and rounded at the tips, the ears are heavy and hang close to the head, without any twist. They are nearly long enough to reach to the nose but not beyond. Medium in length, and strong, with a slight dewlap. The shoulder blade and upper arm are long and sloping, meeting at a good angle that sets the front legs well under the body. The forelegs are lean, strong and straight, with good bone and muscle. The elbows fit close to the body. The pasterns are slightly sloping. The chest is moderately broad and deep, with a well developed forechest. The ribs are oval in shape, deep and long, and reach well back. The withers are barely defined. The topline slopes gently upwards from the withers to the hindquarters. The back is strong and supple. The loin is short, broad and muscular, and the croup is long and fairly flat. There is a slight tuck up. The hindquarters are well angulated to match the front assembly. The upper thigh is broad and very muscular. The lower thigh is long and sinewy. The stifle and hock joints are strong and the rear pasterns are short and vertical. The feet are spoon shaped, with tight, well arched toes, and cushioned pads that are well pigmented. Set on high and medium in length, reaching at most to the hock. It is carried horizontally or slightly slanting downwards. Dense, close fitting and harsh, with little gloss, the coat is finer on the head and ears, and harsher and longer on the belly, legs and tail. Serious Faults: Fine or thin coat. Biscuit, fawn, clear tan through deep red, reddish grey, also brindled or interspersed with black hair. The basic color on the back is generally more intense, and the muzzle and ears are dark. A small white star on the chest is permitted. Serious Fault: Any other color, including black and tan. Height for males is 18.5 to 20.5 inches. For females, it is 17 to 19 inches. Serious Fault: Any deviation from stated sizes. Light and springy, and ground covering, with legs straight and parallel. Missing teeth other than P1.